The self-described "little anarchist in Austin" has been battling the most formidable of opponents — the U.S. government. His cause: Legalize the distribution of weapon-design files that allow Americans to 3D-print firearms at home. Now he is being sued by a dozen states, including Washington. 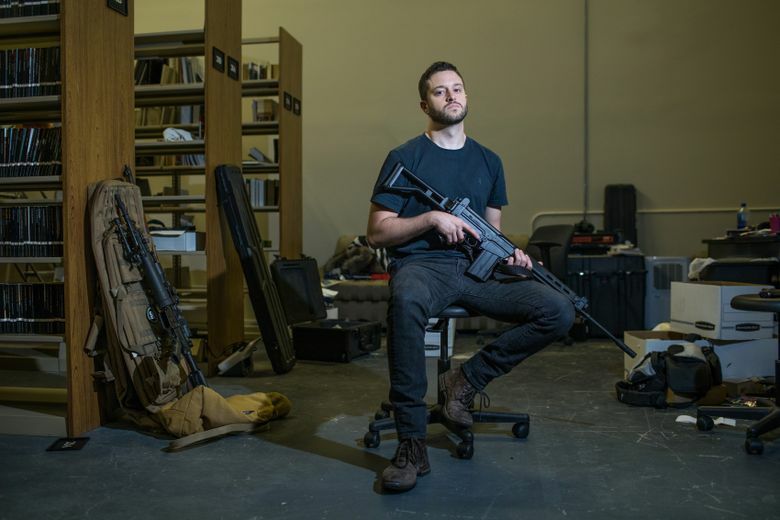 AUSTIN, Texas — The summertime streets are nearly deserted as Cody Wilson, a University of Texas graduate, walks through the school’s Victorian-Gothic buildings toward the main research library. He removes his black sunglasses when he enters the building, unmasking dark circles that reveal months of backlogged sleep. He hurries to the library clerk’s office, worried that he is too late. “I’m glad I caught you. This book is overdue, but I want to check it out again,” Wilson says. He places an index titled “Technical Publications from the Department of Defense” on the counter. The tome is a collection of weapon systems that Wilson hopes will one day help him expand the right to bear arms into the 21st century. “I didn’t have my library card on me. You forget it when you’re on the run,” Wilson tells the clerk, flashing a crooked, droll smile. It’s an ironic quip. Wilson knows he isn’t one to run. For the past five years, the 30-year-old self-described “little anarchist in Austin” has been battling the most formidable of opponents — the U.S. government. His cause: Legalize the distribution of weapon-design files that allow Americans to 3-D-print firearms at home, avoiding layers of federal and state gun-control policies like permits and background checks. Now, Wilson is being sued by a dozen states, including Washington, in four courts. It’s the climax of years of litigation that began in 2013, when Wilson built his first fully printed gun and published the blueprint files on defcad.com, an online community where users upload and download designs. A week later, the federal government stepped in demanding he remove them. Wilson says publishing information for the production of firearms is protected speech under the First Amendment. “We don’t err on the side of censorship in this country,” he said. But his critics say his plan could put unregulated and difficult-to-detect weapons in the wrong hands, creating a public safety crisis. “It makes no sense to make downloadable guns available to any felon, domestic abuser or terrorist,” said Washington state Attorney General Bob Ferguson, one of many who have sued to stop the distribution of Wilson’s 3D-gun designs. Wilson’s legal case neared an end in the spring, when he entered into a settlement with the federal government that gave him permission to upload the much-contested files. But the agreement was temporarily blocked by a federal judge, and Wilson shut down the site. But he refuses to stand down. He says he should not have to answer if a person is harmed by a gun created from his blueprints. He sits down at a booth, props his knees up on the plastic banquette and says that he is committed to fighting the onslaught of lawsuits against him. The battle has gotten expensive for Wilson, and he’s scrambling to raise funds. But he attributes his dedication to the “honor culture” of the American South. The government doesn’t expect Americans to spend half a million dollars in court on a point of principle, he said, opening a laptop. He began to rearrange a website, making it less text heavy and moving its “call to action” link to a more prominent position, a request for donations for his legal fight. “Unlike other crazy anarchists, I take pride in doing what I say I’ll do,” he said. Wilson grew up on tales of the American South and lore of pioneers and folk heroes, including his ancestor, John Rutledge, a Declaration of Independence signer and former South Carolina governor and Supreme Court justice. As a young boy, Wilson was no stranger to guns. His parents kept them in their home, but they were in the background — under the bed or in a closet in case of a home invasion. He feels the same now. For him, homemade guns are simply a means to push the limits of U.S. gun-control politics and constitutional rights. His Christian childhood household instilled a belief that the republic’s foundation was godly and that all men were given inalienable rights. He doesn’t try to erase that cornerstone of his upbringing, though his viewpoints have intensified. Until Wilson turned 10, his father, Dennis, pastored a church in Hope, Arkansas. Every Sunday, the family of four drove two hours from Little Rock to the farmland countryside. They stayed for lunch, then drove two hours back home. Both of Wilson’s parents, who met as schoolchildren, worked full-time jobs during the week — his father as an attorney and his mother as an insurance agency’s network administrator. Wilson has the support of his family, according to his father, though they would welcome his moving on from this particular cause, either to the next big thing or back home to Arkansas. His father has always viewed the word “anarchist” unfavorably. The elder Wilson fears how his son’s “less reserved” lifestyle will affect him later in life. His mother worries he has chosen a life of conflict and making enemies. Cody Wilson is mission-driven. He says that under the First Amendment, information should be free; in this case, that information is the blueprints to build firearms. As a law-school student, Wilson aimed to do something new in the U.S. firearm debate: to design a gun on a commonly available device. Years later, he said the technology doesn’t create good or bad behavior, but enables both. His father noted that humans have been committing violent acts since Cain and Abel. “Wicked people are going to do it one way or the other. If you have a good rock, you can have the same outcome,” Dennis Wilson said. Even after he reached an agreement with the federal government this spring, Cody Wilson rarely allowed himself to consider the settlement a done deal. A few days before the scheduled Aug. 1 relaunch of his site, his attorney, Joshua Blackman, learned that a trio of gun-safety groups had filed an emergency motion to scuttle the agreement. Less than 24 hours later, Blackman walked into the Western District of Texas court to argue on his client’s behalf. Wilson did not come; he said he wanted to avoid the press and was advised to stay out of the state. Instead, he ate shrimp and grits on the waterfront patio of a hotel in Sandestin, Fla., and waited to hear from his lawyers on their second day in court. Finally, in the early evening, Wilson’s phone buzzed. His attorney had messaged him in all caps: YOU WIN. The judge had ruled from the bench. Ninety minutes later, he had a letter from the federal government, allowing him to publish the files. “Cody, post now,” said Blackman, as soon as Wilson answered his phone. The New Jersey attorney general and Los Angeles city attorney had already threatened to sue. Blackman strategized that having the files up would make it harder for a court to order them be removed. Wilson drew the curtains in his hotel room, sat down and went to work because, he said, he knew anything could happen. After five years, the first file he published was a full technical plan for the AR-15, the “football” in the current gun-control culture war. With his attorneys’ greenlight, Wilson republished 10 files that evening. All 10 designs were already online on other sites. One was 3D-printable. Wilson’s files were up in the public domain for five days before eight attorneys general and the District of Columbia asked U.S. District Judge Robert Lasnik in Seattle to block the government from allowing the blueprints online. After an hourlong hearing, he granted the request and issued a temporary restraining order. Although Lasnik’s directive applied only against the federal government, it effectively criminalized the files that Wilson had been authorized to upload days earlier. Blackman asked Lasnik for clarification — if his client did not shut down the website, would he be violating federal law? Blackman called his client to share the news. It’s the most recent time Wilson can remember crying. “Obviously it was tough,” Wilson said. After years, he got the resolution he wanted. Then it was taken away. “Nothing’s ever finally over. That’s my own lesson to other people. There’s no finality to these things,” he said. Even before the court issued a written order, Blackman advised his client to shut down the website. Following the law, Wilson did. By 8 p.m., it was dark. Deanna Paul covers national and breaking news for The Washington Post.